A small silver badge designed to wear on a shooting cap or hat. It will hold one pair or at the most, two pairs of woodcock pin feathers – a little beauty. My oval PIN FEATHER BROOCH has been a great success with orders coming from as far afield as Russia, the States and of course all the European countries – in fact everywhere that this splendid bird is found and admired. Introduced in early 2011 this badge has proved to be our most popular product; cast in silver by the lost wax process with smokey topaz eyes it is a little beauty. I call the model a rhoding woodcock and it is perfect in every way. The back has a stainess steel pin with a silver roller safety catch. 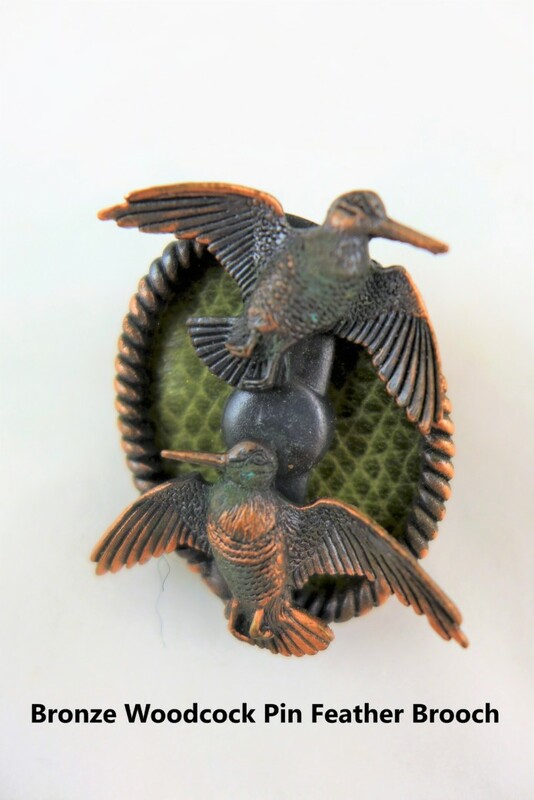 This badge will take a pair of pin feathers or if you are very careful two pairs, they are held at the back by a small round silver nut which clamps the feathers to the back of the badge, it is best to tighten this nut with a small pair of pliers. 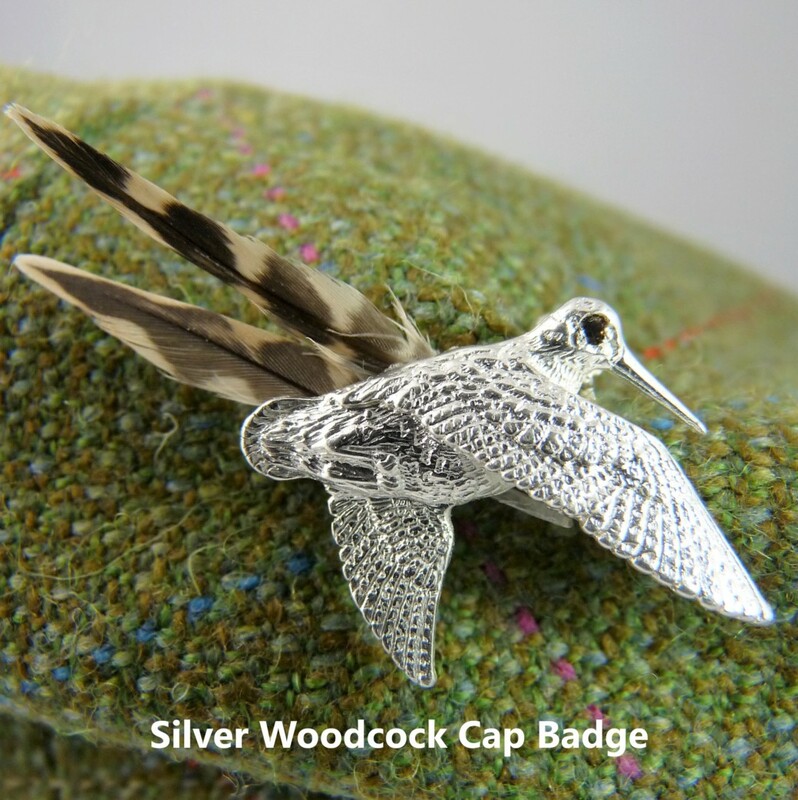 This badge is quite light and it is designed to be worn on a tweed shooting cap. We also make this cap badge in silver gilt ( gold plated ). Neither are hall marked and they come in a small blue box with our logo; a most acceptable gift. This oval brooch will take about 30 pin feathers and at 30 mms high and double sided, it is best worn on a lapel or an upright hat – for something suitable to wear on a cap , please see our PIN FEATHER CAP BADGE; this is lighter in weight and designed specifically for a tweed cap. 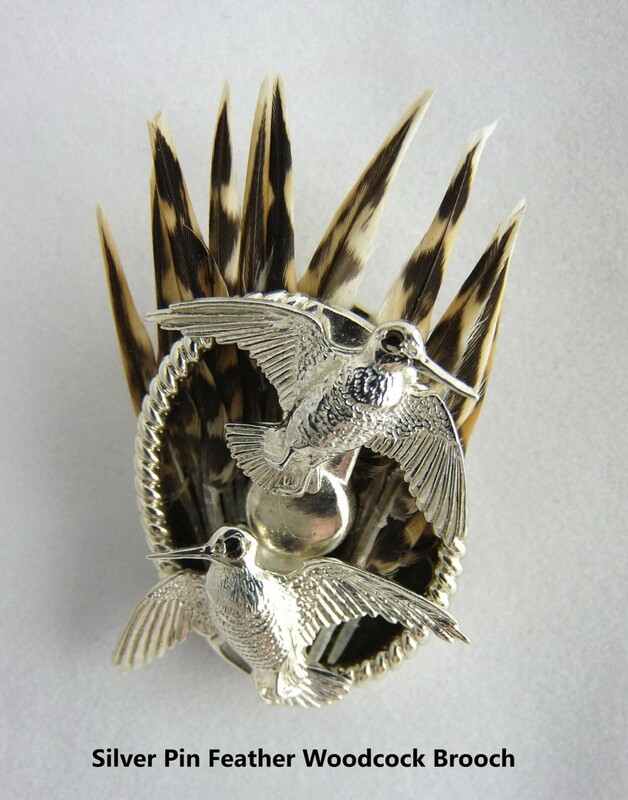 The silver brooch has two halves which are joined together with two screws; the two halves separate and the pin feathers are trapped with a leather slip in between. This brooch, like its smaller brother is made from sterling silver and is hall marked in Birmingham. The pin feather brooch Brooch weighs 22.5 grams and the rope oval measures 30 x 23mms. Both of the woodcock have smokey topaz eyes and the brooch is held onto the cap or coat by a strong stainless steel pin which has a good roller safety catch. 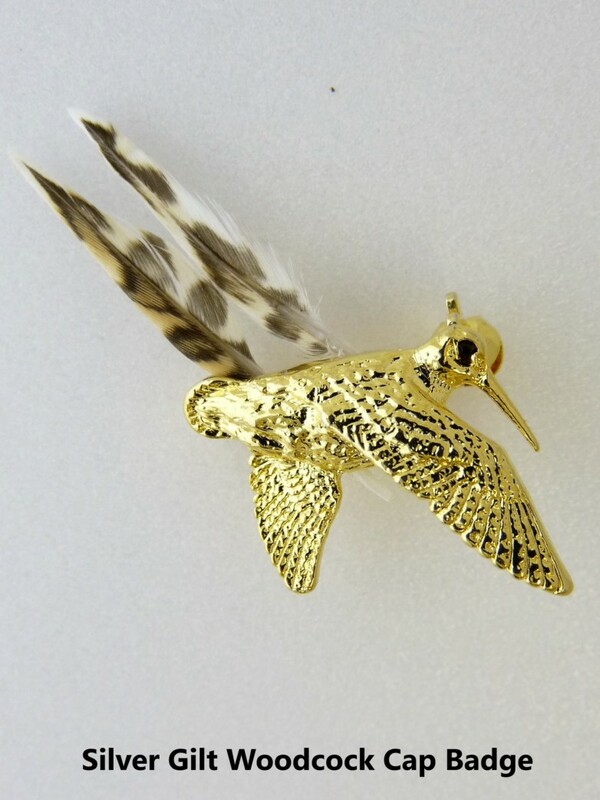 This pin feather brooch is also available in bronze. Made in the Birmingham Jewellery Quarter. A bit of a struggle to get the feathers in, needed a pair of small pliers to screw it out and in. The size of the screw I quite large compared to the pin assembly which makes pinning it a bit difficult. But a very nice pin and once ready looks very good. Happy to display my first woodcock. Great item, reliable seller, fast shipping- highly recomended!! I find the clasp isn’t very secure for the pin feathers. Feel as if I need to glue them also to be safe. Otherwise I’m happy.